The BizTalk Adapter Pack provides connectivity to an external web service in order to generate the appropriate schema files. The BizTalk Adapter Pack can be installed in conjunction with, or separately from, BizTalk Server. To work with the adapter you will need to install the BizTalk Server Adapter Pack (Adapter Pack is available through BizTalk Server <version> medium e.g. DVD/ISO). Once installed you can start making use of its features. Main possible cause will be Microsoft BizTalk Adapters not installed properly. The Consume Adapter Service tool will only be available in your Visual Studio if you install the Tools options from the WCF LOB Adapter SDK. This option will include the Adapter Code Generation Wizard and Visual Studio Addin Components. Run the BizTalk Server <version> installer as Administrator and click "Install Microsoft BizTalk Adapters", Check step #1 and step #2 installed properly. With admin privilege run the BizTalk Server <version> installer and make sure you closed visual studio and BizTalk Server administration console before start this process. Select step 1. Install Microsoft WCF LOB Adapter SDK, An installer of SDK is launched, click next. Note: I personally recommend that perform a full installation (all components) of the WCF LOB Adapter SDK on BizTalk Server Development environments. 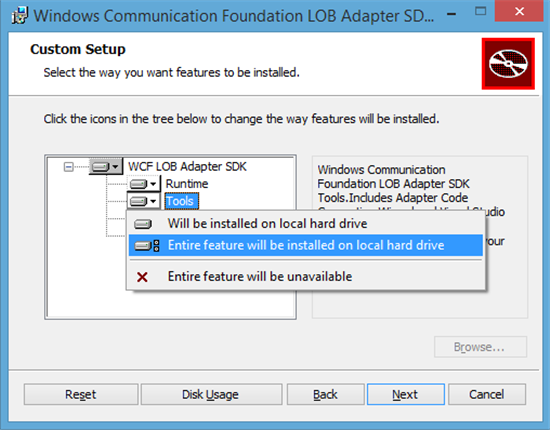 On the "Custom Setup" page, make sure that you select the option "Tools" to be installed and click "Next"
On the "Ready to change Windows Communication Foundation LOB Adapter SDK Setup" page, click "Install" (for new Installation) or "Change" (for existing Installation) to begin the installation. Second step is installation of the Adapter Pack (x86). By clicking Microsoft BizTalk Adapter Pack needs to be installed an installer is launched again. Next step is installing the Microsoft BizTalk Adapter Pack(x64). Before installing this pack you have to install x86 first, which is overlooked a lot of times in past by people. There are documentations to install adapters pack, you can refer that also during BizTalk Installation.